Not to be confused with Allotrophy. 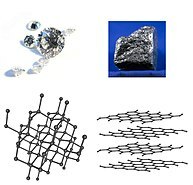 Diamond and graphite are two allotropes of carbon: pure forms of the same element that differ in crystalline structure. Allotropy or allotropism (from Ancient Greek ἄλλος (allos), meaning 'other', and τρόπος (tropos), meaning 'manner, form') is the property of some chemical elements to exist in two or more different forms, in the same physical state, known as allotropes of the elements. Allotropes are different structural modifications of an element; the atoms of the element are bonded together in a different manner. For example, the allotropes of carbon include diamond (the carbon atoms are bonded together in a tetrahedral lattice arrangement), graphite (the carbon atoms are bonded together in sheets of a hexagonal lattice), graphene (single sheets of graphite), and fullerenes (the carbon atoms are bonded together in spherical, tubular, or ellipsoidal formations). The term allotropy is used for elements only, not for compounds. The more general term, used for any crystalline material, is polymorphism. Allotropy refers only to different forms of an element within the same phase (i.e. : solid, liquid or gas states); differences in these states alone would not constitute examples of allotropy. For some elements, allotropes have different molecular formulae despite difference in phase; for example, two allotropes of oxygen (dioxygen, O2, and ozone, O3) can both exist in the solid, liquid and gaseous states. Other elements do not maintain distinct allotropes in different phases; for example, phosphorus has numerous solid allotropes, which all revert to the same P4 form when melted to the liquid state. The concept of allotropy was originally proposed in 1841 by the Swedish scientist Baron Jöns Jakob Berzelius (1779–1848). The term is derived from Greek, Modern άλλοτροπἱα (allotropia), meaning 'variability, changeableness'. After the acceptance of Avogadro's hypothesis in 1860, it was understood that elements could exist as polyatomic molecules, and two allotropes of oxygen were recognized as O2 and O3. In the early 20th century, it was recognized that other cases such as carbon were due to differences in crystal structure. Allotropes are different structural forms of the same element and can exhibit quite different physical properties and chemical behaviours. The change between allotropic forms is triggered by the same forces that affect other structures, i.e., pressure, light, and temperature. Therefore, the stability of the particular allotropes depends on particular conditions. For instance, iron changes from a body-centered cubic structure (ferrite) to a face-centered cubic structure (austenite) above 906 °C, and tin undergoes a modification known as tin pest from a metallic form to a semiconductor form below 13.2 °C (55.8 °F). As an example of allotropes having different chemical behaviour, ozone (O3) is a much stronger oxidizing agent than dioxygen (O2). Typically, elements capable of variable coordination number and/or oxidation states tend to exhibit greater numbers of allotropic forms. Another contributing factor is the ability of an element to catenate. Diamond – an extremely hard, transparent crystal, with the carbon atoms arranged in a tetrahedral lattice. A poor electrical conductor. An excellent thermal conductor. Lonsdaleite – also called hexagonal diamond. Graphene - is the basic structural element of other allotropes, nanotubes, charcoal, and fullerenes. Graphite – a soft, black, flaky solid, a moderate electrical conductor. The C atoms are bonded in flat hexagonal lattices (graphene), which are then layered in sheets. Fullerenes, including Buckminsterfullerene, a.k.a. "buckyballs", such as C60. Carbon nanotubes – allotropes of carbon with a cylindrical nanostructure. Among the metallic elements that occur in nature in significant quantities (56 up to U, without Tc and Pm), almost half (27) are allotropic at ambient pressure: Li, Be, Na, Ca, Ti, Mn, Fe, Co, Sr, Y, Zr, Sn, La, Ce, Pr, Nd, Sm, Gd, Tb, Dy, Yb, Hf, Tl, Th, Pa and U. Some phase transitions between allotropic forms of technologically relevant metals are those of Ti at 882 °C, Fe at 912 °C and 1394 °C, Co at 422 °C, Zr at 863 °C, Sn at 13 °C and U at 668 °C and 776 °C. 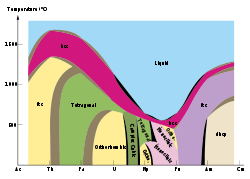 Phase diagram of the actinide elements. Cerium, samarium, dysprosium and ytterbium have three allotropes. Praseodymium, neodymium, gadolinium and terbium have two allotropes. Plutonium has six distinct solid allotropes under "normal" pressures. Their densities vary within a ratio of some 4:3, which vastly complicates all kinds of work with the metal (particularly casting, machining, and storage). A seventh plutonium allotrope exists at very high pressures. The transuranium metals Np, Am, and Cm are also allotropic. Promethium, americium, berkelium and californium have three allotropes each. In 2017, the concept of nanoallotropy was proposed by Prof. Rafal Klajn of the Organic Chemistry Department of the Weizmann Institute of Science. Nanoallotropes, or allotropes of nanomaterials, are nanoporous materials that have the same chemical composition (e.g., Au), but differ in their architecture at the nanoscale (that is, on a scale 10 to 100 times the dimensions of individual atoms). Such nanoallotropes may help create ultra-small electronic devices and find other industrial applications. The different nanoscale architectures translate into different properties, as was demonstrated for surface-enhanced Raman scattering performed on several different nanoallotropes of gold. A two-step method for generating nanoallotropes was also created. ^ a b c Jensen, W. B. (2006), "The Origin of the Term Allotrope", J. Chem. Educ., 83 (6): 838–39, Bibcode:2006JChEd..83..838J, doi:10.1021/ed083p838 . ^ "allotropy", A New English Dictionary on Historical Principles, 1, Oxford University Press, 1888, p. 238 . ^ Raj, G. Advanced Inorganic Chemistry Vol-1. Krishna Prakashan. p. 1327. ISBN 9788187224037. Retrieved January 6, 2017. ^ a b Udayabhaskararao, Thumu; Altantzis, Thomas; Houben, Lothar; Coronado-Puchau, Marc; Langer, Judith; Popovitz-Biro, Ronit; Liz-Marzán, Luis M.; Vuković, Lela; Král, Petr (2017-10-27). "Tunable porous nanoallotropes prepared by post-assembly etching of binary nanoparticle superlattices". Science. 358 (6362): 514–518. Bibcode:2017Sci...358..514U. doi:10.1126/science.aan6046. ISSN 0036-8075. PMID 29074773. ^ a b c "Materials That Don't Exist in Nature Might Lead to New Fabrication Techniques". israelbds.org. Retrieved 2017-12-08. Chisholm, Hugh, ed. (1911). "Allotropy" . Encyclopædia Britannica (11th ed.). Cambridge University Press. Wikimedia Commons has media related to Allotropy.